Welcome to the final part of our look at different elements of metal rhythm guitar. Over the course of the previous four installments we have examined a lot of different elements of picking, scales and last week a look at cross rhythm and irregular metre ideas. Most of what we’ve looked at has been very focused on picking hand dexterity, stamina and control. Whilst good picking is the defining skill required for metal rhythm guitar, many bands have employed two handed tapping into their riffing style. 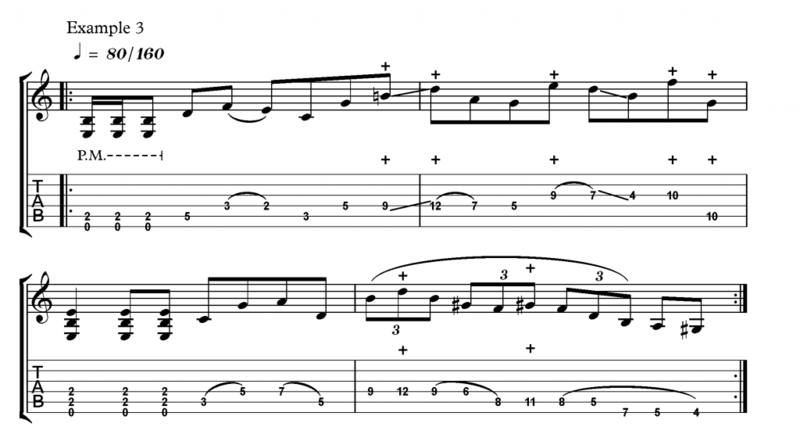 Tapping is usually thought of as a lead guitar technique for executing ludicrously fast legato licks. However, it can also be a great functional tool for creating interesting riffs containing wide intervals that might otherwise be impossible for either the picking or fret hand. Tapping with the fingers of both hands on the fretboard can feel very like drumming, and applying rhythmical repeating patterns to notes can provide interesting sounds, reminiscent of keyboard arpeggiators owing to the smoother sound than that achieved by picking. With the picking hand on tapping duty, the fretting hand must also learn to hammer on to notes too. These are known as left hand tapping, or ‘hammer-ons from nowhere’. Developing the strength may be an uphill struggle for a little while, particularly in the first finger which never usually has to hammer on. Depending on the tone you are using, whether for clean or distorted parts, you will want to consider whether to hold notes on or not. Tapping can be a great way of keeping extra notes ringing into each other to create rich clean chord patterns, but the same idea played with distortion would just be chaotic and messy. With a distorted sound you will generally only want one note sounding at a time. It may be worth experimenting with a compressor and slightly more gain than your usual rhythm sound to help bring out the tapped notes, and even out the difference between picked and tapped notes. However, practicing to achieve a good strong attack with the tapping fingers should go a long way towards solving this. The biggest hurdle when learning tapping riffs will be muting the strings to stop them ringing out. Normally the palm of the picking hand can take care of this at the bridge, but when tapping this is obviously not an option. The best solution is to keep the fingers of the fretting hand flat against the strings so that it mutes anything higher than the string being played. The tip of the fretting finger can also mute the next lowest string in this position too. It may be worth practicing hammering on to notes with just your right hand to adopt this hand positioning and you may notice your regular guitar playing gets cleaner too once this becomes second nature! Firstly we have a simple octave based idea that should help to develop the left hand hammer ons. You can try using either fingers one and three of the picking hand to tap, or two and four, so you can keep hold of the pick. Now we develop the exercise from example 1 into a more interesting rhythmic pattern. Notice the use of 32nd note in beats two and three. These really help to give the rhythm a nice contour, and sound a lot more difficult than they really are. The end result of these kinds of tapping riffs can start to sound a little like slap bass parts, particularly because of the use of repeating octaves. The last of our tapping riffs is very technical so start slowly and make sure the hand movements are fluid and fully memorised before speeding up. A common problem with many guitarist’s legato technique is that it lacks the same time keeping that they would have if picking the same rhythm, so be aware and make sure that the notes are even. The best test is to record yourself playing, and try to record the same part over itself (known as double tracking) This is standard practice for recording, so practicing it now will pay dividends later. I hope you’ve enjoyed this series on the different elements of metal rhythm guitar playing as much as I have putting them together. Feel free to ask any questions in the comments, or request any further articles on specific topics! Now, go forth and start playing your favourite metal songs with a new sense of command and control, or better yet start writing your own tunes! Recommended listening: Limp Bizkit guitarist Wes Borland has been known to use a clean two handed tapping style, usually for verse riffs, in songs like Re-arranged, and Sour. More recently Sikth took the tapping style and applied it to their angular and extremely technical style of riffing on their excellent album ‘Death of Dead Day’. Another great example is actually in the bass break in Dream Theater’s Metropolis Part 1, where John Myung plays a series of octave based tapping shapes.